Consummate storyteller Dean Koontz does it again with a hauntingly beautiful story of a young boy growing up in the sixties and the strange and dangerous city he loves. The city in question is (of course) New York City, a place where dreams—and occasionally nightmares—come true. But it’s more than that . . . though to say more further would risk a spoiler. Told from the perspective of his older self, Jonah is just eight when the story begins, a skinny kid who longs to become “a piano man” like his beloved grandfather. His mom is an accomplished musician herself, a singer. His dad isn’t accomplished at much of anything but causing trouble, especially for Jonah and his mom. 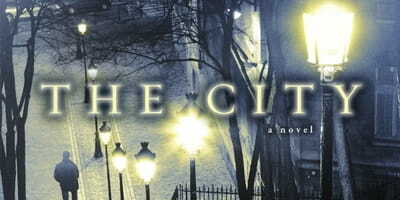 But The City is more than a book about music and people who make it; it’s a book that reads like music. Every phrase is perfectly pitched and set in a rhythm that will keep you reading long past your bedtime. There’s a lot more to this story than a boy and his piano. Dark forces are at work in this mystical tale. Over the next three years young Jonah will find himself on the wrong side of some very bad people. Warned in dreams—in an almost biblical way—Jonah tries his best to keep himself and those he loves safe. But he is just a kid, so his choices are not always the wisest. Helping Jonah make sense of the evil around him is his neighbor, Mr. Yoshioka. Come to find out, the little black kid and the little Japanese man are kindred spirits. Set against a backdrop of race riots and bombings, the gentle beauty of their growing friendship is one of the highlights of the book. Koontz weaves his tale with a master’s touch, dropping hints here and starting stories there, only to break off and promise to finish them later. This could have been irritating, but here it serves to heighten the suspense and add to the feeling of impending doom. The City is a story of love and loss, triumph and tragedy. It’s a story about music and art and the power of friendship. It will keep you on the edge of your seat as the tension builds, forces collide, and the plot crescendos to a dramatic resolution. There’s a reason Dean Koontz has so many #1 New York Times bestsellers to his credit—and why The City has already made the list. He is just that good.